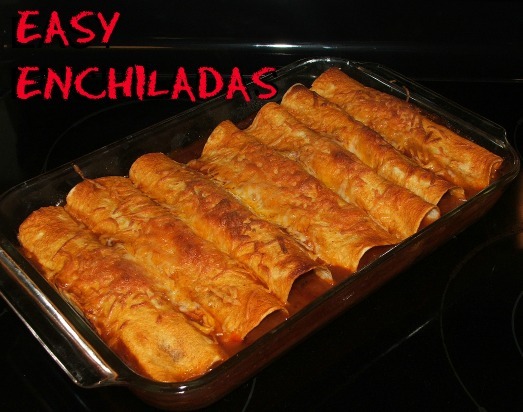 This is a simple recipe for enchiladas that I have made several times. It’s quick and easy. I sometimes make it ahead of time and refrigerate for a few hours before baking. Brown the ground beef and drain the fat off. Add the can of Rotel and let the beef and Rotel simmer until the juice is gone. Bake at 350º for approximately 30 minutes – until bubbly and golden. To make it even easier stack the enchiladas instead of rolling them. Put a little sauce on the bottom of an 8 or 9” cake pan or other baking dish. Moisten a tortilla with some sauce and top it with filling and a little cheese. Repeat, stacking tortillas and filling on top of each other. I use a total of 5 tortillas in a stack. Don’t put filling on the 5th tortilla. Pour some sauce over the last tortilla and top the stack with cheese. 5 tortillas works for me because the stack doesn’t get so high that starts sliding over, and tortillas typically come in packages that are multiples of 10. Bake just like you would rolled enchiladas. I often use leftover meat in the filling, extending it with a can of black beans if I don’t have enough. My kids loved it and my husband calls it his favorite comfort food.